The new GF620 is FLIR's highest resolution OGI camera. Equipped with a 640x480 infrared detector, the camera is calibrated to measure temperature, allowing the user to assess the thermal contrast between the gas and the background scene, and adjust it to improve visibility. 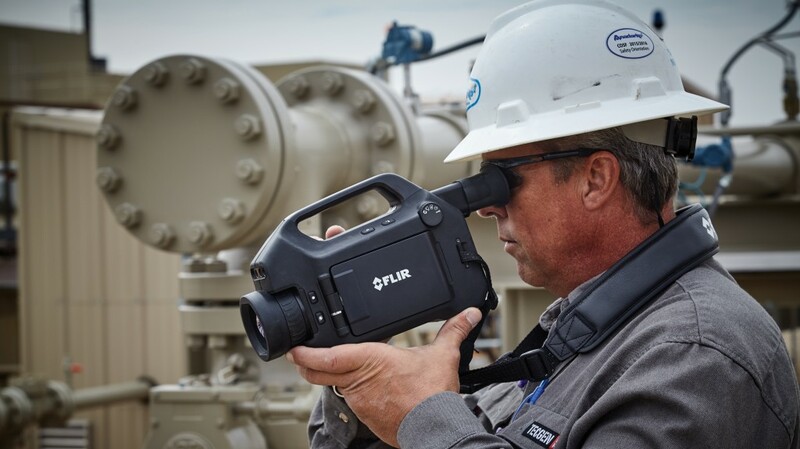 The new GF620 is FLIR's highest resolution OGI camera. Equipped with a 640x480 infrared detector, the camera is calibrated to measure temperature, allowing the user to assess the thermal contrast between the gas and the background scene, and adjust it to improve visibility. The FLIR GF620 also features the company's unique high sensitivity mode, which accentuates plume movement to improve detectability in low-contrast scenes. The GF620 additionally introduces Q-Mode, an automatic preset for use with the optional QL320 gas quantification system by Providence Photonics. This system quantifies hydrocarbon leaks with mass or volumetric measurements and colorizes emissions for easier assessment. The GF620's Q-mode streamlines the workflow from the camera to the QL320 software, so users can download a video from the field and post-process the footage.